Knauf Earthwool Insulation is a new generation of super-soft and highly sustainable glasswool. It is thermally efficient and cost effective in saving energy and providing increased comfort in buildings. 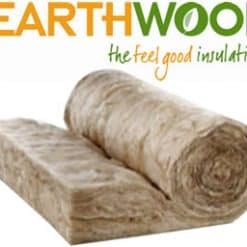 Knauf Earthwool Insulation is non-combustible and also reduces unwanted noise from outside the home and limits sound transmission from room to room. Made using recycled glass bottles, sand and with ECOSE Technology, Earthwool sets a new benchmark for insulation sustainability and ease of handling. Knauf Earthwool Wall and Ceiling Batts provide a cost-effective thermal and acoustical barrier for energy-efficient construction. Earthwool Wall and Ceiling Batts can be used in timber and metal frame applications in residential structures. These applications include thermal and acoustical treatments to walls, ceilings and floors. Knauf Insulation offers Earthwool Wall and Ceiling Batts in a wide range of sizes and R-values.